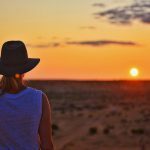 Take the Stars, Parks and Legends self drive tour from Charleville to Longreach, Outback Queensland. Discover the wonder of night skies, opal fossicking towns and unforgettable sunset moments. Explore Welford National Park, find your favourite fishing spot or take a step back in time to Australia’s pioneering past. Highlight: Charleville is famous for its renowned Cosmos Centre and Observatory where you can "Journey to Infinity" as you explore the night sky. 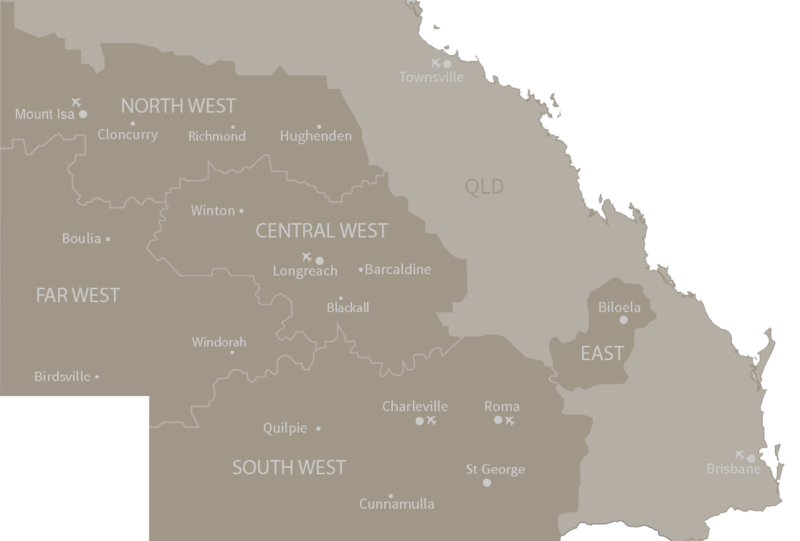 Your journey begins in Charleville, which is the largest town in South West Queensland and is located on the banks of the Warrego River. Charleville is famous for its renowned Cosmos Centre and Observatory where you can “Journey to Infinity” as you explore the night sky through the powerful Meade telescopes, hold meteorites in your hands and hear why Pluto was taken out of the Planet Club. Meet the delightful and interesting Bilby, one of Australia’s most endangered species, at the Save the Bilby Experience. The Charleville School of Distance Education and the Charleville Royal Flying Doctor Base are also worthwhile attractions. Westlander. Hire car facilities are also available. Highlight: See the literal "End of the Railway Line" and the Mini Museum. Drive west from Charleville along the Diamantina Developmental Road to Quilpie, home to “The Jewel of the Outback”, the exquisite boulder opal. Try your luck at the free opal fossicking area and visit St Finbarr’s Church and admire the stunning Opal Altar, Lectern and Font. Visit the Quilpie Powerhouse Museum and learn how Quilpie became the first town to have a Powerhouse in 1952. See the literal “End of the Railway Line” and the Mini Museum at the Airport, which is dedicated to the old Wool Scour and the unexpected landing of Amy Johnson. 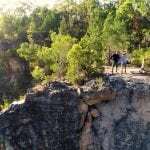 Take a stroll along the Bulloo River walk on the shady banks of the river. Interpretative signs are positioned along the way to inform you about the variety of trees and plant s. The waterways of Quilpie Shire are ideal for bird watching and fishing. Highlight: Meet Australia’s largest dinosaurs including ‘Cooper’ and ‘George’, who are in the top 10 largest dinosaurs in the world. Highlight: The waterholes offer great fishing and the smaller channels are ideal for catching yabbies. Take the fully sealed Kyabra Road to being your journey towards Windorah, the heart of the Channel Country. Windorah, which is Aboriginal for “Big Fish”, is 35 kilometres south of where the Thomson and Barcoo Rivers join to form the multi-channelled Cooper Creek. Follow the 12 kilometre Nature Drive through a diverse range of landscapes between Windorah and Cooper Creek. The waterholes offer great fishing and the smaller channels are ideal for catching yabbies – the inspiration for the Windorah International Yabby Race held annually in August. Visit the original slab hut in Windorah, which was relocated from its original site on the Whitula Creek banks and tells an interesting historical story of the town and its people. Windorah Solar Farm is the first solar farm trial by Ergon Energy with five mirrored dishes that generate enough power from the sun to supply most of Windorah’s energy requirements. 80 kilometres west of Windorah lies the JC Pub Ruins, once part of the township site of Canterbury. Windorah offers cabins, hotel, caravan and campsites. Highlight: You can see a rare (rammed earth) homestead built on this former grazing property in 1882. Departing Welford National Park, drive a short distance to Jundah on the banks of the Thomson River – an ideal spot for some scenic fishing and river drives. Jundah is the closest town to Welford National Park and is an ideal base if you would prefer day visits. Explore the Barcoo Shire Museum offering a window into the early pioneering times of the district, including the mysterious “Barcoo Dog”. Highlight: Stunning views are to be had from two vantage points, particularly the westerly lookout at sunset - a fantastic spot to boil the billy. Drive 32 kilometres north of Jundah on the Stonehenge road to The Native Well, a valuable source of water for Indigenous people in days gone by – marvel at how these wells were manually created. Situated halfway between Jundah and Stonehenge is Swanvale Lookout on the Johnstone Range. Stunning views are to be had from two vantage points, particularly the westerly lookout at sunset – a fantastic spot to boil the billy. Take the eight kilometre John Egan Pioneer Drive (suitable for four wheel drive vehicles only) and discover magnificent landscapes sculptured by nature over millions of years into the most amazing rock formations. Highlight: Enjoy a cruise on the Thomson River complete with sunset nibbles, dinner and entertainment. 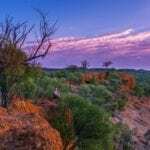 As you leave Stonehenge on the top loop road, turn left on the Longreach-Jundah Road, where you’ll pass XXXX Hill, a scenic vantage point with breathtaking 360 degree views of the Thomson River flood plains and surrounding Johnstone Ranges. About two kilometres from the Stonehenge turnoff en route to Longreach, you can sign the visitor’s book – Stonehenge style. This involves writing your town name with stones – a quirky tradition started years ago by the then mailman. Take some time to read through the many town names that can be seen embossed in stone. 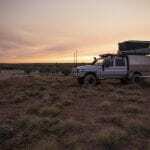 Continue your drive to the heartland of Outback Queensland – Longreach. Soak up the history and heritage with visits to the Australian Stockman’s Hall of Fame, Qantas Founders Museum and Powerhouse Museum. Enjoy a cruise on the Thomson River complete with sunset nibbles, dinner and entertainment. Tour though one of the largest classrooms in the world at the School of Distance Education or experience the thrill of a Cobb and Co. ride.